MORE than 100 people came out of the woodwork at the Gayndah Show to cheer on the axemen in their final chop of the day. 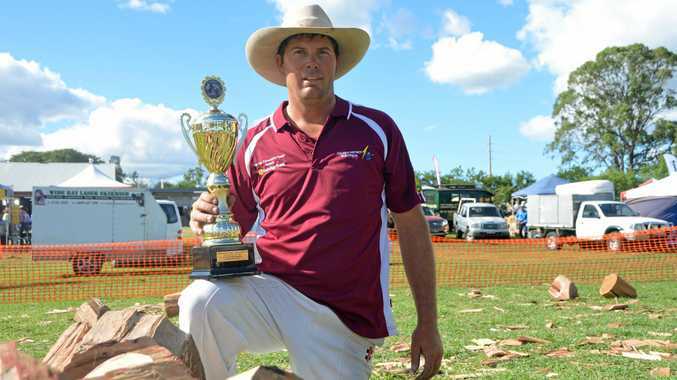 Mundubbera resident Luke Dingle proved to be the strongest of four competitors in his favourite event - the 11-inch underhand chop - to cap off a strong performance at Saturday's show. "It doesn't look like we are having much fun, but we do and we have a good joke,” he said. Dingle also took home the James Herbert "Herb” Carbery memorial trophy as the winner in the 12-inch underhand event. The Sydney Easter Show drew a lot of competitors away but a field of six contested the program in Gayndah. Saturday marked the start of a busy few months for Dingle, who is set to compete at all the upcoming shows in the North Burnett, continuing in Mount Perry on Saturday. In addition to his passion for the sport, it is Dingle's love for his family and mates that keeps him competing, as well as it being a good excuse to have the day off work. "It is a good sport with all your mates and also a good family sport with my brother-in-law here and you get a lot of friends over the years. It is good to catch up with them on the weekend,” he said.